Westley, Buttercup, and Humperdinck: Ashish Streatfield, Tessa Jackson, Samir Streatfield. EAST MARLBOROUGH — The cult classic 1987 Rob Reiner film “The Princess Bride” will come to the stage at Unionville this Thursday, Friday, and Saturday. Framed as a story recounted by a grandmother to his ill granddaughter in modern day America, the play is an adventurous romantic-comedy set in medieval times. The show tells the tale of star-crossed lovers in the fictitious country of Florin who are separated by chance and reunited by true love. 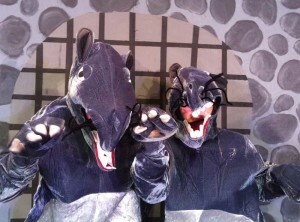 The script wasn’t the only student-produced piece of the production. “Juniors Evelyn Pandos and Molly Basilio came to me with a complete storyboard of what they thought the stage should look like for each scene. The students really took the lead on every aspect of this play,” said Ballard. “The Princess Bride” begins with a child (Jackie Tremblay) home sick from school, while her grandmother (Natalie Walden) reads her a story. The story is about two lovers, Buttercup (Tessa Jackson) and her farmhand Westley (Ashish Streatfield). After they are separated, Buttercup becomes a princess upon her engagement to Prince Humperdinck (Samir Streatfield), who secretly plots to expand his kingdom through war. Buttercup is kidnapped from Humperdinck by the mischievous trio of Fezzik, Inigo, and Vizzini (Christian Waibel, Abu Akki, and Charley Bloomfield), only to be chased down by the mysterious Dread Pirate Roberts. This sets up a murderous chase, a trek through the dangerous fire swamp, and eventually a revelation before the climax of the show. The wedding scene from The Princess Bride. First Row, L-R: John Cronin, Nick Esteves, Fiona Weir, Tessa Jackson, Samir Streatfield, Ryan Nilsen. Second Row: Annie Belgan and Jordan Hodess. Third Row: Brian Kelly, Caroline Salisbury, Amy Gottsegen, Rachel Stoltz, Hannah Chidekel, Jess Oehler, Simran Jain. Other cast members include Jordan Hodess and Annie Belgam as the King and Queen, as well as John Cronin and Claudio de Bennedetto as Count Rugen and Yellin. 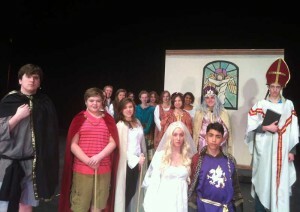 Brian Kelly plays the Albino, while David Biddle and Hannah Chidekel portray Miracle Max and his wife, Valerie. Catherine Stookey plays Falko, Ryan Nilsen plays the Priest, and Brian Kelly and Jessica Oehler portray the ROUS (Rodents Of Unusual Size). Lastly, Kati Roper, Caroline Salisbury, Fiona Weir, Simran Jain, Rachel Stoltz, Amy Gottsegen, and Nick Esteves all play townspeople, “ancient booers”, or brutes. The show looks to be an amazing performance, especially considering it is something of an experiment. The students, having grown up watching this movie many times, have ensured that the performance is faithful to the movie’s classic characters and famous lines. Look for the Streatfield brothers to put up great performances, as well as Tessa Jackson’s impassioned and serious portrayal of Princess Buttercup. 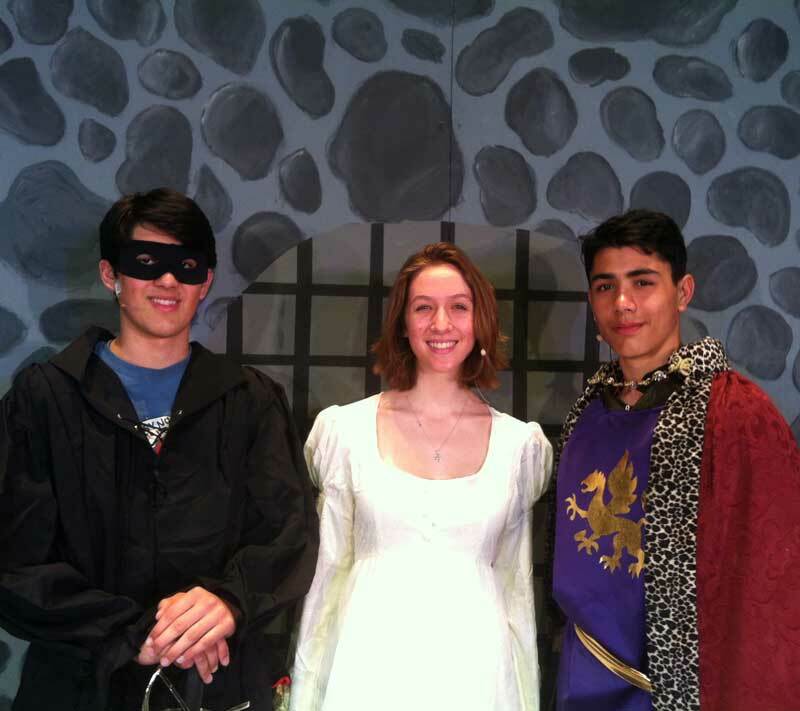 “The Princess Bride” debuts Thursday, April 25 at 7 pm, with additional shows Friday at 7 pm and Saturday at 1 pm. Tickets are $5 for students and $7 for adults and are available at the door at the Unionville High School Auditorium before each performance. Come see this fun, frenetic, and fanciful show that has been adapted by a student, designed and executed by students, sound and light designed by students, with high school and middle school participants. It is a true collaborative effort. Suitable for children and adults alike. Come join in the laughter!